The Johnson River bisects Kasigluk, Alaska. 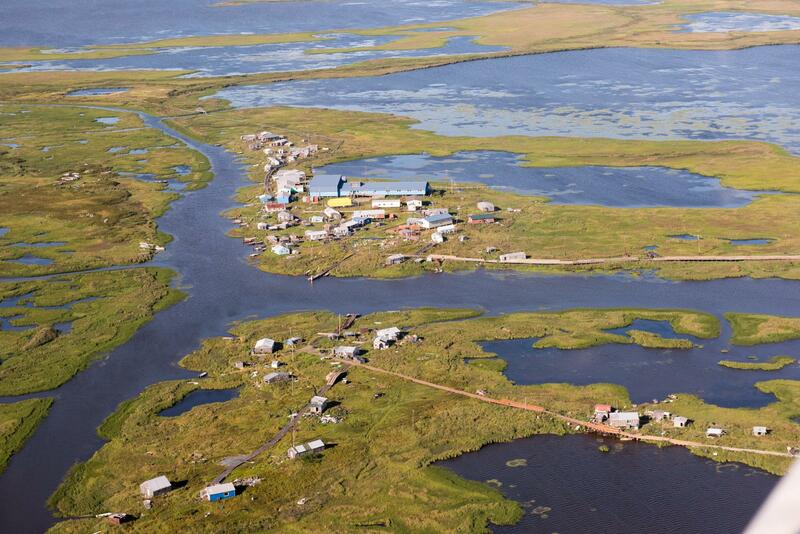 Many communities across the Yukon-Kuskokwim Delta are reporting a higher than usual voter turnout this Election Day, even where dicey river conditions are making getting to the polls dangerous. Throughout the day, the voice of election worker Jamie Tinker has been crackling over Kasigluk’s VHF radio, encouraging people to vote. “And then a couple minutes later, more people would come,” she said. Tinker has worked the Kasigluk polls for five years, and she is seeing a higher than usual turnout this election. But she’s concerned that not everyone who wants to cast a ballot will make it to the voting booth. The Johnson River divides Kasigluk into two sections, and ice had begun forming weeks ago. A couple of days earlier, temperatures started climbing, destabilizing the thin ice. All Election Day, the sun has shone bright and warm. Also in Kasigluk, the search continues for Wassilie Keane, who went missing on October 24. This morning the search group met in the Tribal Office where elections are being held. The group voted, and headed out again to look for the missing man. The same river that divides Kasigluk also bisects the community of Nunapitchuk, where the watery ice cancelled school today. These unstable ice conditions have become normal for both Nunapitchuk and Kasliguk as warmer seasons have pushed freeze up deeper into winter. Goodnews Bay is also seeing a healthy voter turnout. The election committee chairman for the community, Samuel Kavelala, says that might have something to do with Coastal Villages Region Fund offering a free meal to people with “I Voted” stickers. “There was hamburgers, hotdogs, chips, soda,” Kavelala listed. CVRF is offering everything from full barbaques to snacks served with hot chocolate in its communities to encourage voting today. The local CVRF workers decide which foods are availalbe. In Mekoryuk, a quarter of the available ballots had already been cast by 1:30 p.m. Election worker Lincoln Shavings expects to have a late night. Mekoryuk’s electronic voting machine is not working, and the workers will be hand-counting ballots. It’s not the first time. In the community of Eek, Election Committee Chairman Maryann Hawk has overseen elections for about 30 years. She says that voter turnout for this election is one of the highest she’s ever seen, and she wasn’t able to share much more with KYUK. Another voter had walked in.